Cataracts are most often attributed to advancing age, with half of the population either suffering from cataracts or having undergone cataract surgery by the time they are 80 years old. Although this vision problem may seem unavoidable to some people, there are in fact ways to reduce your risk, even as time marches on. Namely, smoking has been positively linked with an increase in cataract risk, leading cigarette and cigar smokers to have a disproportionately high prevalence of vision loss. If you are in the Monterey area and have a history of smoking, our eye care center wants to help you avoid any potential complications or the need for cataract surgery. Refer to the below information to learn about the link between smoking and cataracts so that you may continue to preserve your vision and overall health. A cataract is a clouding of the eye’s lens, a normally clear structure within the eye that helps refract and focus light. This clouding is essentially a form of degraded tissue, which may occur gradually over time or as a result of injury of disease. While some people may also be congenitally predisposed to developing cataracts, everyone can take certain steps to reduce their risk. As noted below, smoking cessation can make a profound difference in whether cataracts form at all. In addition to its many specific risks, smoking results in a generalized inhibition of the body’s immune system and ability to regenerate. This therefore increases the likelihood of many diseases and conditions that are caused by damaged tissues, and cataracts are no exception. 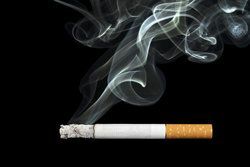 Multiple studies have shown that smoking tobacco products increases the risk of cataracts, and this risk continues to rise with the history and frequency of smoking habits. Some studies suggest that heavy smokers, such as those who smoke 15 or more cigarettes per day, have a nearly 50 percent greater chance of developing cataracts. This correlation continues to rise with the number of cigarettes or cigars used, showing a clear relationship between smoking and vision loss. How Does Smoking Cessation Help? Because the risk of cataracts continues to increase with a patient’s smoking habits, abstaining from cigarettes and cigars will prevent these odds from rising further. For those who quit earlier in life, the impact is likely more significant, but the damage caused by smoking can never be fully reversed. Even those whose history of smoking remains long in the past, there is still a statistical increase in the risk for cataracts. Thus, the key is to stop as early as possible. Ideally, people should never pick up a cigarette in the first place. Some conditions are more treatable than others, but many present clear risks to one’s vision and health even when appropriate treatment is sought. Rather than undergo one or more procedures to restore your vision, consider the benefits of abstaining from all forms of tobacco use. If you suspect that you may be suffering from cataracts or another form of vision loss, our eye center is prepared to help you quickly and effectively. Contact us to schedule an exam or consultation, and get the treatment you need to preserve your vision.